"Here was a man of total commitment to the missionary cause to which he devoted his life. That shines through in every phase of his life,” Bishop Colm O’Reilly. A new biography charting the life of Irish missionary, Bishop James Moynagh, from his birth in Cavan to his subsequent ministry in Nigeria and role in the establishment of the Kiltegan Fathers has just been launched in Ireland. Bishop James Moynagh of Calabar by Colman M. Cooke (Columba Press, €24.99) recounts the story of a man who was prominent in the Irish missionary outreach of the 1930s and the Maynooth Mission to Africa, which later became known as St Patrick’s Missionary Society. 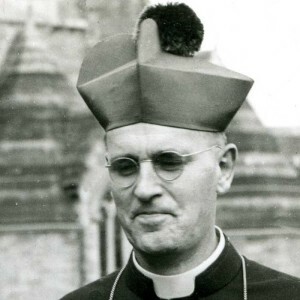 The biography also documents Bishop Moynagh’s (1903-1985) role in the education of women in Nigeria by the Sisters of the Holy Child Jesus, the founding of the Medical Missionaries of Mary and that of the Handmaids of the Holy Child Jesus. The author, Fr Colman Cooke, is a Kiltegan Father, who has written and lectured widely on the history of the Church in West Africa. James Moynagh was born on 25 April 1903 in Loughduff, Mullahoran, Co Cavan. After national school locally he went to secondary in St Mel’s College, Longford. He was ordained in Maynooth in 1930 for his local Diocese of Ardagh and Clonmacnois. He responded to an appeal for volunteers to staff the vicariate of Southern Nigeria in 1930 and after four years he returned to Ireland in 1934 to serve as a curate in Drumlish, Co Longford. But late in 1934, he was appointed Prefect Apostolic of Calabar and Ogoja in Nigeria under the auspices of the new St Patrick’s Missionary Society. He was involved in subsequent years in establishing many foundations such as schools and hospitals to meet local needs. In 1947, the Prefecture of Calabar became a Vicariate, and James Moynagh was appointed its first bishop. He was ordained as a bishop in Maynooth in September 1947. A year later, Calabar Cathedral was opened in June 1948. In his Preface, Bishop Emeritus of Ardagh and Clonmacnois, Dr Colm O’Reilly, writes that what began as a temporary mission in 1930 continued until 1969, when Bishop Moynagh became a casualty of the Nigerian Civil Was and was refused re-entry to his diocese. Once again he returned to his home diocese of Ardagh and Clonmacnois and ministered for some years in Annaduff, Co Leitrim. He spent his last years in Kiltegan and died on 11 June 1985. His belief in the right to equal educational opportunities for women and girls was forward thinking for his time, as was his commitment to fostering a local church leadership. The Irish missionary ordained the first West African bishop, D. I. Ekandem who later became a cardinal, and developed a local diocesan clergy. With the help of the Society of the Holy Child Jesus, he was involved in the formation of the Handmaids of the Holy Child Jesus. “The biography which Fr Colman has written is a vindication of sincere and simple tributes paid to Bishop Moynagh, a man of whom the Irish Church can be truly proud. Here was a man of total commitment to the missionary cause to which he devoted his life. That shines through in every phase of his life,” Bishop O’Reilly states in his tribute.